I have walked past this particular branch of Yolk located at 355 E. Ohio Street on the corner of Grand & McClurg in Streeterville on many occasion on my way back and forth towards Navy Pier but until this day I had never walked in. I had been to one of their other sites over in River North before and I always enjoy their simple take on that wonderful meal that starts our day; breakfast. On this trip back to my expat hometown I was staying just around the corner at the Allerton so it was much easier to stroll over for my morning eggs. Even though the outside temperatures had dipped well below freezing, inside I was to receive a warm welcoming plate of food. 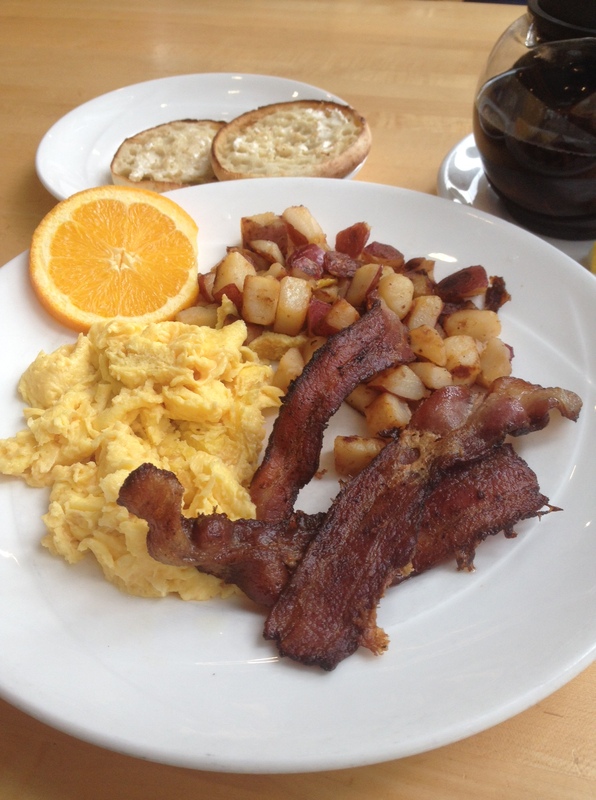 I do love a nice plate of American style breakfast, today I broke my fast simply with scrambled eggs, breakfast potatoes and some excellent crispy American bacon strips. The meal also came with a choice of breads so I went for the toasted English muffin, then to drink I had a pot of tea for which I have to give a special mention. All too often over here in the States it is so hard to get a good cup of tea, but here at this particular Yolk I received a really good pot full of scalding and warming tea, so good that I had three cups full. Officially my choice from the menu was called “Two eggs and Meat” which was a choice of “Two eggs any style with your choice of hickory smoked bacon, sausage links, low-fat turkey, sausage, canadian bacon or hickory- smoked ham steak.”. I had the hickory smoked bacon which was really good and almost candy like with a decent smoky taste. I kind of came here just for that bacon but everything else on the plate also made me happy as well. The scrambled eggs were soft, creamy, and filled half of that big white plate. The chunky fried red potatoes were also plentiful, and I even ate most of them. I was glad that they still resembled actual potatoes too. The toasted muffin was an added bonus and went well with one of those pots of free marmalade. All in all a very successful start to my morning and for $8.99 not too bad value either. 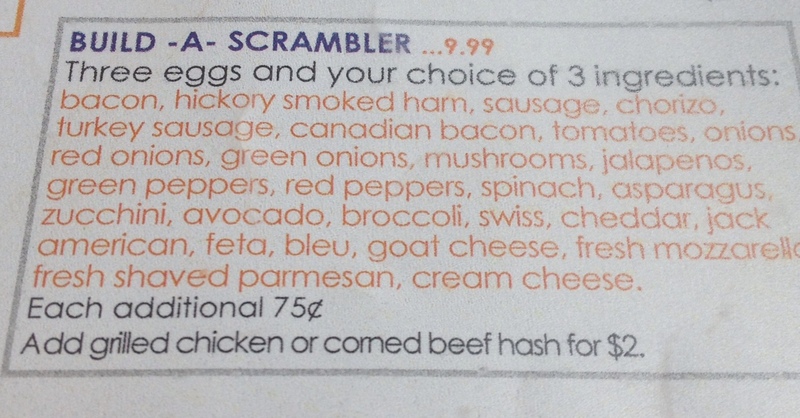 I have ordered this ‘Build-A-Scrambler’ plate before at other Yolks in the city and it is huge. So huge that I didn’t order it today as I wanted to be able to eat again at some point. My choice of the three ingredients is usually the Chorizo, Jack Cheese, and Mushrooms. I kind of like that combination. Spicy, Salty, Crunchy, Meaty, Cheesy and a Big plate of Eggs. Awesome! I should have had this…. I think on reflection I should have taken a leap of faith and ordered the Chicken ‘n’ Waffles as it now sounds so good reading that section of the menu. What’s not to like? Bacon? waffle? Chicken? Sausage Gravy? Maple Syrup? That all sounds good to me! Adding a fried egg for just another 75cents? How could one not?